Cairn India's ambitious exploration project may make its oil block in Barmer the country's biggest in three years. About four kilometres from the nearest human settlement, surrounded by undulating sand dunes as far as the eye could see, cooped up in an office that was little more than a portable cabin made of glass fibre, Harley Davidson still managed to look happy. So happy that he seemed to love even the sugary, powdery coffee the machine in his office squirted out. The Canadian national, with the same name as the world's most iconic motorcycle, had just struck oil - for the seventh time since he came to Barmer, in Rajasthan's Thar Desert, a few months ago to drill for Cairn India. "Whatever we are doing is bearing fruit," Davidson beamed, as he climbed on to the rig platform, big enough to accommodate about five fully-grown adults, and pointed excitedly to the monitors. To the naked eye, it was just a lot of green lines flickering against black background; to Davidson it was sheer poetry even if it gave details of the depth, heat and pressure that the tip of the rigs 25-metre arm had reached. "We will strike oil there as well," he said, pointing to a corner of the monitor. He may have leapt in joy had he not been weighed down by his dungarees, helmet and industrial boots whose top surface was hard enough to kick a cast iron football and not feel pain. The seven points where Davidson has drilled comprise one well for Cairn India, which has embarked on an exercise to drill 450 such wells by the middle of 2016, involving 17 rigs just like the one Davidson runs. If all goes to plan, the Barmer block, with its seven alluringly named fields - Mangala, Bhagyam, Aishwariya, Raageshwari, Shakti, Saras and Barmer Hill - will become bigger than Bombay High. Today, there are 11 rigs drilling at Barmer. Bombay High, with 584 wells, has been the one high point in oil-starved India since 1974. 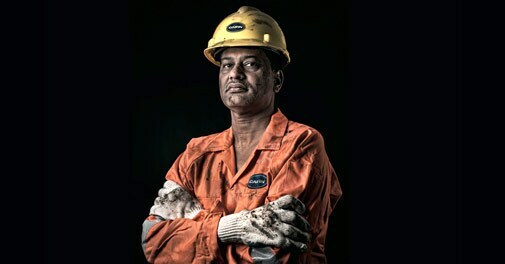 "On average we are targeting drilling annually anywhere between 150 and 200 wells," says P. Elango, CEO of Cairn India. 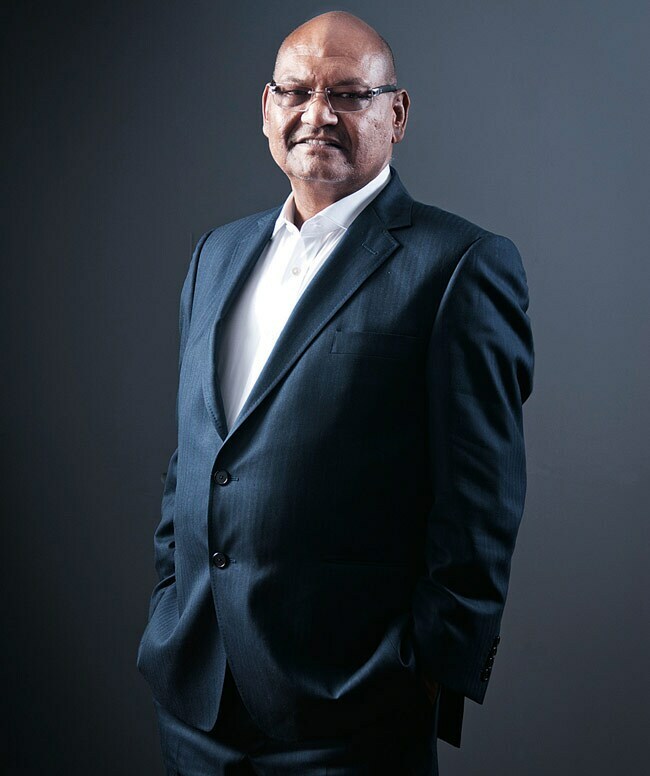 Anil Agarwal's London Stock Exchange-listed Vedanta Resources, a diversified metals and mining company, owns 59 per cent of Cairn India through its Indian subsidiary Sesa Sterlite. Cairn is already a success story, having drilled 201 wells in Barmer over the last 15 years. As much as 196,000 barrels of oil oozes out of this block every day, which could touch 300,000 barrels a day in three years, compared with 280,000 for Bombay High. Some analysts project peak production anywhere between 239,000 and 265,000 barrels but concede a higher output is also achievable. But that would pinch ONGC, the Bombay High operator, only to an extent, as it holds 30 per cent equity in Cairn-operated Barmer block. 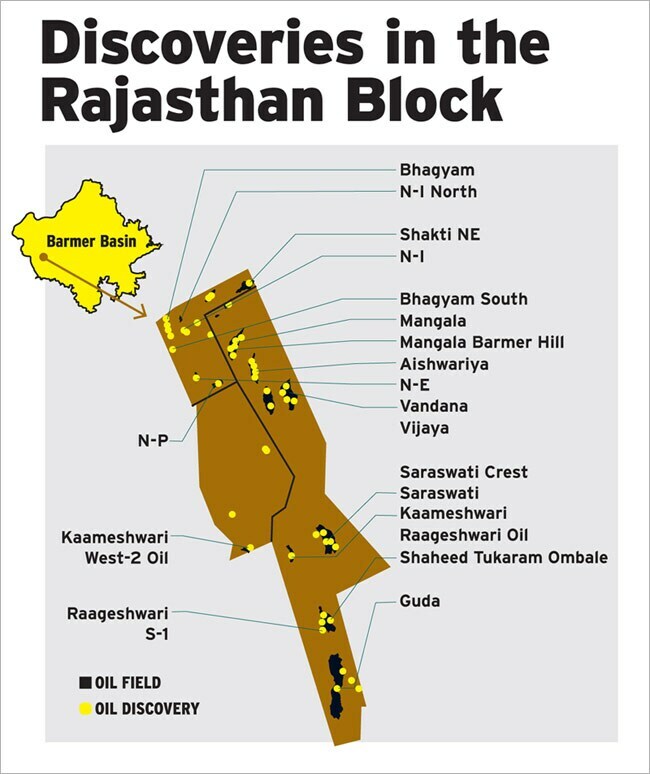 Cairn has stakes in seven oil and gas blocks in the country but Rajasthan is its biggest bet. Out of Cairn's planned operational expenditure of $3 billion over the next couple of years, 80 per cent is likely to be spent on this block. Four years ago, Anil Agarwal, Chairman of Vedanta Group, might not have thought of entering the oil and gas business. Cairn Energy Plc was believed to be in talks with Reliance Industries to sell its share of business in Cairn India. Instead, Vedanta stepped in to buy a majority stake in August 2010. Today, more than half of the groups earning before interest, tax, depreciation and amortisation (EBITDA) comes from Cairn India. And 80 per cent of the revenues of Cairn comes from the Barmer block. "[Cairn India] has the potential to be an example of Indias success in the global oil market," Agarwal said in a column he wrote on February 12 (click). While Agarwal's other businesses grapple with uncertain headwinds, Cairn India continues to surge ahead. It is sitting on a cash pile of $3.5 billion which allows the company to scale up. Indeed, it is very unlikely that Cairn will be able to consume all its cash in Rajasthan alone, say analysts. "There (by farming in semi-developed blocks) is scope for Cairn to go beyond this block and prove to the world that it is not a one trick pony," says Vikash Jain, oil and gas analyst at CLSA. It is perhaps also the reason why Agarwal had expressed interest in the Haldia Petrochemicals stake sale in 2013 and had also wanted to be a part of a refinery project in Rajasthan in 2012. He backed out at the last moment and now appears focused on the oil exploration business. "Our core area is exploration, and we would like to stick to this only," says Elango. Cairn India Chief Financial Officer Sudhir Mathur believes that it is not the right time to invest much in businesses where the company does not have the expertise. "At the current time (when interest rates are high) I do not mind keeping the money in bank deposits as well," he adds. To boost Barmer output, Cairn has got approval of the Petroleum Ministry in October for an integrated block development plan (IBDP). A new policy initiative by the ministry, it aims to enable companies to move oil and gas fields from the discovery to the production stage faster. An overarching IBDP replaces the earlier practice of the government approving capital spending only for discoveries that are proven to be commercially viable for production and allows operators to take prior approval for budgets for up to three years. As part of this plan, Cairn got the approval to drill 450 wells, out of which 100 would be drilled to explore oil and 350 to develop the fields. "IBDP helps me in planning and bringing any new discovery into the production stage much faster. It cuts down roughly about 50 per cent of the lead time. Let's say, in the past, the time to bring the discovery to production was roughly about 36 months. It should help to get it to 18 to 24 months now," says Elango. Petroleum Ministry officials acknowledge that Elango pushed this policy and was subsequently supported by the rest of the industry. "IBDP will provide flexibility to Cairn to manage production at the Barmer block," says Somshankar Sinha, oil and gas analyst at Barclays Hong Kong office. Elango has entrusted the operations at Barmer to Suniti Bhat, a young reservoir engineer, who executes the vision of the management. Bhat says his immediate plan is to capture oil from satellite fields and small discoveries across the block, especially in Mangala, Bhagyam and Aishwariya (MBA) oil fields. Satellite fields are smaller fields spread across the block, which might produce oil in smaller quantity but make exploration activities commercially viable. Bhat is simultaneously working on the application of enhanced oil recovery (EOR) methods at Mangala field. It is the oldest field in Cairn's block and is producing roughly 151,000 barrels a day but in all probability has reached its peak output. EOR is a special technology to recover oil trapped in the grooves of rocks. This technology is generally used in ageing wells but at Mangala it has been used much earlier. "Out of 100 barrels in the reservoir, only 35 barrels are coming out, 65 are not. We are hoping to get most of it," says Bhat. Cairn expects roughly 15 per cent more oil production from the EOR technique - an additional 22,500 barrels of crude daily. "Already Mangala has started, which will be followed by Bhagyam and Aishwariya," says Bhat. ICICI Securities in a December 13 report said it expects EOR to show dividends by 2015/16. Indeed, this will be the world's biggest EOR application, which will add an additional 90 million barrels over the economic life of the block. The second largest EOR project is in Oman, half the size of Cairns operation. "I see good potential in the EOR method and it is likely to increase the production at Mangala and subsequently other fields," says CLSAs Jain. Meanwhile, in the first week of December, Cairn recruited Mike Yeager, former global petroleum head of BHP Billiton. Yeager was responsible for the $20 billion conglomerates entry into the US shale gas sector. Besides helping Elango and his team in ensuring the availability of rigs, his understanding of tight-oil recovery is also being utilised. Tight-oil is normally a light crude oil found in sedimentary rock formations. There are tight oil reserves at Barmer Hill, estimated at 165 million barrels of oil and oil equivalents and Cairn is targeting this reservoir. Moreover, with the New Exploration Licensing Policy (NELP) expected to allow companies an integrated approach to developing the blocks they win, Cairn will certainly look for options to develop shale prospects there in the future. "I am sure whenever we get the opportunity we would be ready," says Elango. Getting ready may involve tackling certain roadblocks. The government has refused the request of Cairn to reallocate the relinquished areas in the Barmer Basin. According to contractual requirements, Cairn India relinquished areas where it had not found any oil or gas. But it now wants the government to return those areas - about 8,000 sq. km - to undertake fresh exploration activity. In the recently announced NELP rounds, bids have been invited for two blocks carved out of these relinquished areas. The Petroleum Ministry is also silent on Agarwal's proposal to sell crude in the international market. Cairn is supplying crude to Indian refiners such as Reliance Industries and Essar Oil at roughly 15 per cent discount to Brent Crude prices. Ministry officials believe that a policy decision on this might be possible only after the general elections due by May. Currently, India exports only refined products and not crude oil. There is another major headache for Agarwal. The government is sitting on Cairn's proposal for extension of the production sharing contract for Barmer and Ravva blocks. The original contract for Barmer expires in 2020. "Since, we have started commercially producing gas from the Raageshwari Deep Gas field (in the Barmer Basin), we are hoping to get the extension of the block via automatic route," says Elango. The current rules of the petroleum ministry allow extension of the contract for the block automatically for 10 years if an operator finds gas. The prerogative to extend the contract is with the government in case of oil discoveries. But the execution of its strategy for the Rajasthan block may well be the acid test for Cairn. "They will have to manage the dip in production at Mangala, Bhagyam will have to be ramped up and new satellite fields will have to begin production. This would be a complex exercise, something which they have not handled so far," says Barclays' Sinha. Clearly, it is a big challenge ahead for the company.